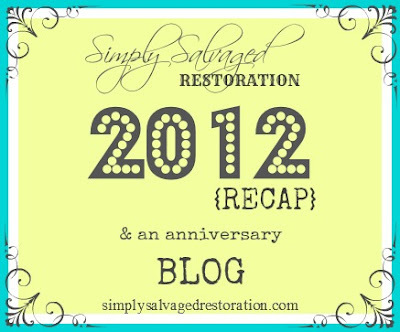 2012 has been an amazing year for Simply Salvaged, I never expected so many doors to open for me in such a short amount of time. It wasn't until October 2011 that I actually finished the medicine cabinet and started working on my 1st set of furniture. I took $50 to Lowe's and bought supplies then pulled the French bedroom set out of our guest room and got to work. It took me almost 3 months to sell the whole set but I used Craigslist to draw people to my Facebook page and kept painting small pieces that I found at thrift stores and yard sales. On December 14th 2011 I was working on this little end table- my 1st custom order for a client that wasn't family or a friend of mine. In January 2012, Mandie of Altard.com, posted that she wanted to mentor a few ladies who were in the 1st years of their furniture business. So, I emailed her with low hopes because I never get chosen for anything but she saw something in my work and chose me to be one of 6 of her protege. Mandie, and the time she has given me, has been the single most best thing for me and Simply Salvaged. Besides the guidance, tips, tricks, and words of encouragement, I gained an amazing friend. Not to mention the awesome ladies who I met through the mentor group. I love them all and they probably don't realized how much their support system has done for me. Then, in March 2012, I got my 1st repeat client. They loved their old antique doors so much that they brought me a yellow china cabinet to paint, too! In May 2012, I booked 28 pieces. In June, I attended the Haven Conference- that I wouldn't of known anything about if not for Mandie. Myself, and 7 other ladies, who I know through Mandie and the mentor group met up in Atlanta for the weekend. This weekend was the 2nd best thing that happened to my business. I learned more than any person should in 2 days and got to be in the same room with 2 people who I admire so much- Marion of Miss Mustard Seed & Rashon of Mr. Goodwill Hunting. If the weekend couldn't get any better, I then got to have dinner with CeCe Caldwell, a few of her retailers, and all of my friends. I sat beside Cece Caldwell. Right beside her. Shoulder to shoulder. SHE BOUGHT ME SALMON. Something about that weekend changed the way I thought about myself and my business. Maybe I just got a big head, idk. Being around the other girls gave me a since of confidence in my ART. I'd never thought of myself as an artist. I gained a respect for my business and my work that I'd never had before. It was at this point that I stopped searching the internet for ideas and stopped comparing my work and my business to my competition. It somehow transformed Simply Salvaged. The first retail piece that I painted after Haven had 6 people in line to buy in within 10 minutes. I was floored. In the following weeks, I painted 2 more of my most popular pieces to date. I was also contacted by Dusty of The Chilled Canvas asking if I'd like to put my furniture in her art boutique- I said of course! I couldn't believe that out of all the furniture flippers in our area she wanted Simply Salvaged in her store. In August I started offering workshops at The Chilled Canvas, and they filled up. Now, I'm working on pieces for my first ''store front'' opening in January. It's actually a booth at University Pickers but it is their store front booth, and I'm the lucky gal who grabbed it up! Since my 1st custom order one year ago today, I've painted 124 pieces, big and small, and we now have furniture in 5 states- Alabama, Tennessee, Georgia, Ohio, & Washington (and we don't even ship!). When I started this business, I never dreamed it could ever grow into what it has. I didn't do it alone, that is for sure. With the help and encouragement from my Husband, my wonderful clients and fans, and the people God put in my life at the very perfect moments, Simply Salvaged has been blessed beyond measure. I don't have words to describe how super fantastic the past year has been. I give God all of the glory for the doors he has opened, the courage he gave me to walk through them, and the people he put in my life- they are all true examples of how God uses his children as vessels. Such an inspiring story. Thanks for sharing and daring to dream.